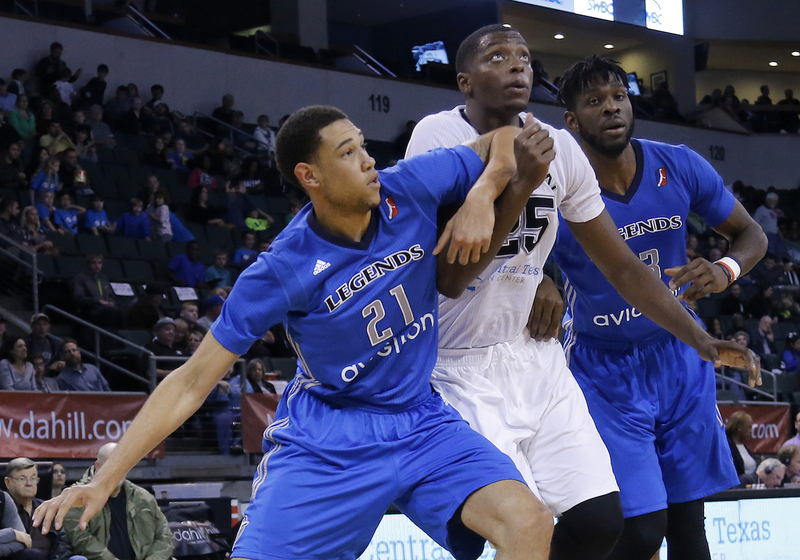 The Texas Legends—the NBA D-League team for the Dallas Mavericks—have fans throughout the Dallas/Fort Worth area that watch its home games live on indie station KTXD/TEXAS47, and view replays on Fox Sports Southwest. The team also has fans in far-off places like China, Japan, India and The Philippines that watch its homes games streaming live via NBADLeague.com—the NBA’s official D-League (Development League) channel on YouTube. International appeal is especially high now that the Texas Legends have a player from India and another from The Philippines. While it’s not unusual to see sporting events on TV or even on the Internet, what is novel is that the Texas Legends produces all of this video themselves—from their own HD video production trailer. And when they’re not producing their own home games—played at the Dr. Pepper Arena—for their regional broadcast partners or for YouTube, this trailer hits the road to produce events for others, including Stockyard rodeos, political debates, sporting events and local parades. TEXAS47 hired the Texas Legends’ video trailer to produce remotes for some of their morning shows. And WFAA-TV8, the ABC affiliate serving the Dallas/Fort Worth area, used it to produce a live town hall meeting about the Ebola crisis that recently impacted local healthcare facilities. Since the trailer doesn’t have satellite uplink capability, a satellite uplink truck is usually booked and parked alongside to handle the transmission. “We’re the only team in our league—and maybe in the NBA—that has its own full-fledged, broadcast quality video production trailer to produce our own home games as well as outside events for our various production partners,” said Malcolm K. Farmer, President of the Texas Legends, in Frisco, Texas. For home games, the Texas Legends produces a full 1080i HD quality product for broadcast television and streams it online at 720p HD for the regular season’s 50 games and April playoffs. Then, in the off-season, when others book the trailer, that revenue defrays the capital and operating costs of its own home games and special projects, such as Beyond the Bounce. 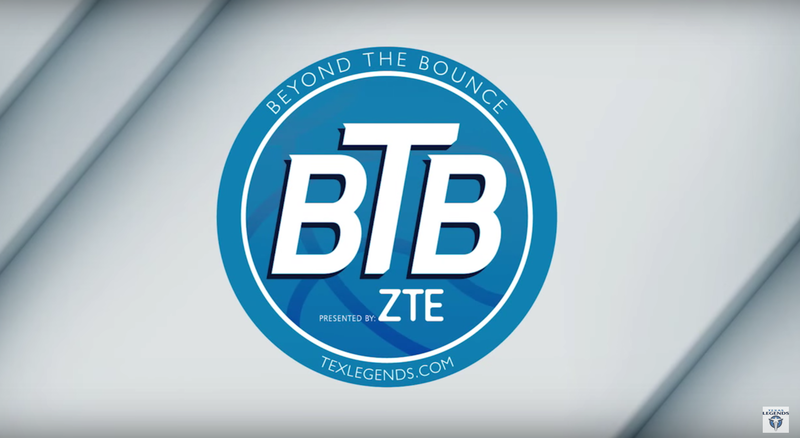 Beyond the Bounce is a 15-minute weekly video podcast that raises awareness and interest in the Texas Legends organization by bringing fans behind-the-scenes to see what’s going on with the team. It’s seen online at the Texas Legends website, and various Texas Legends’ social media outlets. 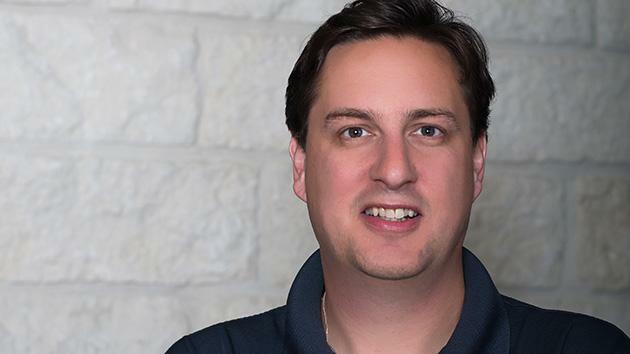 Hosted by Travis Blakeley, each Beyond the Bounce podcast features in-depth interviews with Texas Legends players, such as Forward Jamil Wilson, and front office managers, like Spud Webb, President of Basketball Operations for the Texas Legends. “We’re able to produce our home games, podcasts and other productions at very high quality, very cost-effectively, by taking an innovative approach,” said Farmer. Instead of building and equipping a traditional hi-def truck, which could run into the millions, the Texas Legends outfitted a 38-foot trailer that’s pulled by a Ford F350 pickup. They also took a different approach with respect to the gear on the truck, most of which is from NewTek. This includes two TriCaster 855 integrated production switchers, a 3Play 820 replay system and LiveText for live graphics. 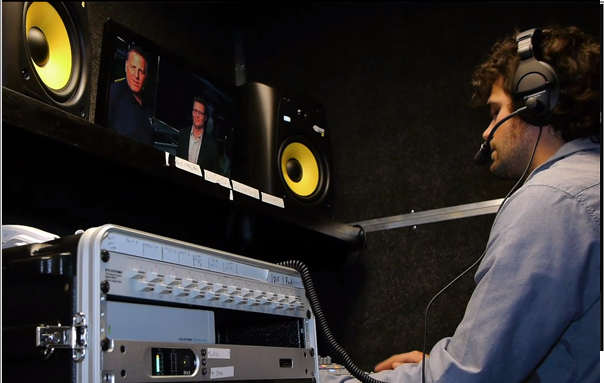 Rounding out the trailer’s equipment package is a PreSonus audio mixing board that’s used to mix 17 or 18 live audio sources and IFB gear from RTS Communications. There are five Panasonic HPX-370 HD cameras, two of which are positioned high up in the stands on tripods. One of them captures beauty shots of the court at the Dr. Pepper arena and the other gets close-ups of players and game action. Two other cameras are handheld to capture game action from opposite sides of the court. They’re also used for impromptu courtside interviews with players and coaches during breaks. The fifth is used for pre- and post-game interviews, but not during the game. Finally, there are two full 1080p HD-SDI box-style security cameras that are mounted behind the glass on the backboards to get close-up “dunk angles” of the balls as they swish into the net. 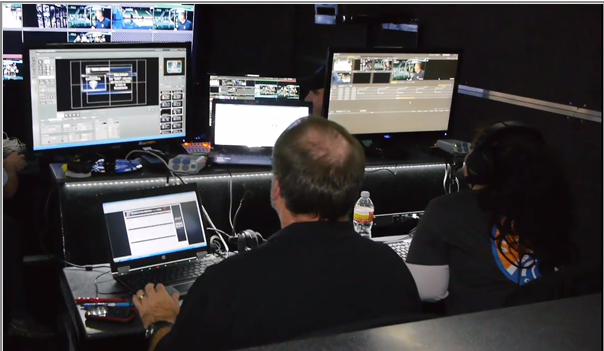 “While each of the  D-League teams has its own TriCaster to produce and stream their live games on YouTube, we’ve taken ours to a much higher level with our fully outfitted trailer,” said Kyle Judkins, senior director of digital media and production for the Texas Legends. Judkins serves as the main engineer managing the trailer; however, during live games, the Engineer-in-Charge is Matt Fields. Judkins said that they did their own systems integration on the trailer, which includes a video control room and a separate, acoustically isolated, 6x8 foot audio mixing suite. “For a live television broadcast like this one, you’d normally have a crew of 20 to 25 people working at various positions, but we usually have a relatively small crew of just 13 to 14 people, including two full-time staff members,” Judkins said. For Beyond the Bounce, Judkins is able to “TD” the whole production (meaning serve as the technical/creative director), while mixing the audio and overseeing graphics, live text and other production details. He’s assisted by a single camera operator who operates a tripod-mounted camera in the studio, equipped with a basic set consisting of a desk and two chairs. The two TriCasters are used in tandem to produce the dual-feed for the live TEXAS47 broadcast and live YouTube stream. 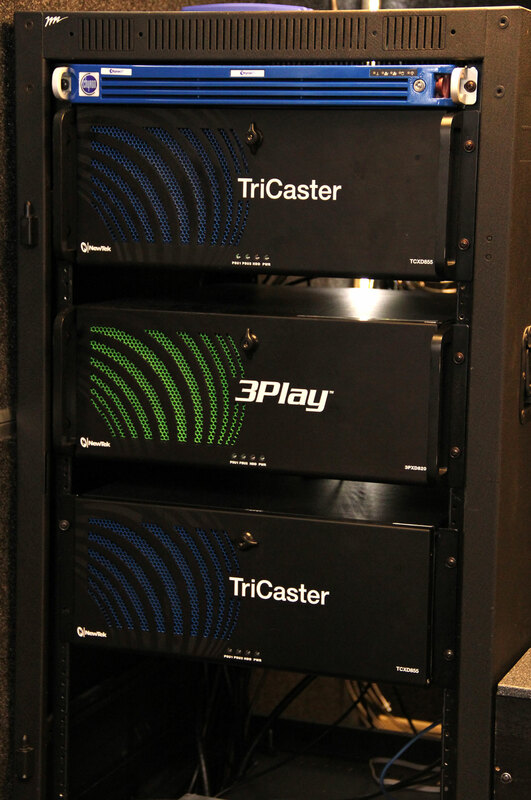 The first TriCaster is responsible for producing and delivering the live YouTube program. Considered the “main” switcher, its inputs include signals from all six HD cameras, the audio mix, and the instant replay feed created by a replay operator using NewTek’s 3Play system. Besides creating replays during the game, 3Play is also recording the TriCaster’s program feed for redundancy. Within 20 minutes of the final buzzer, the 3Play operator takes the recorded footage and begins creating highlights packages focused on featured players and plays. This involves creating playlists, tagging footage and exporting the highlights. Since these Texas Legends’ instant replays and highlights packages are sponsored, 3Play drives additional revenue for the video operation. The main switcher’s output delivers the live stream to the NBA’s network operations center, in Secaucus, NJ, which in turn delivers it to the YouTube channel. That program is also recorded onto the main TriCaster for redundancy. Judkins says that these assets are very valuable to them, and so protecting and preserving them at every turn is a big priority. One of the main TriCaster’s program outputs becomes the second TriCaster’s primary input. This unit is responsible for taking the YouTube program and enhancing it with logo bugs, sponsors’ ads, and other branded elements that are not appropriate for use on the YouTube stream, but which are needed for the broadcast feed. The program feed is delivered from the arena to the station via a direct fiber path. The Texas Legends are in the third year of a 3-year broadcast agreement with TEXAS47, which has aired all of their homes games. OKLAHOMA CITY, OK - NOVEMBER 15: Josh Huestis #34 of the Oklahoma City Blue defends against Jamil Wilson #13 of the Texas Legends during an NBA D-League game on NOVEMBER 15, 2015 at the Cox Convention Center in Oklahoma City, Oklahoma. 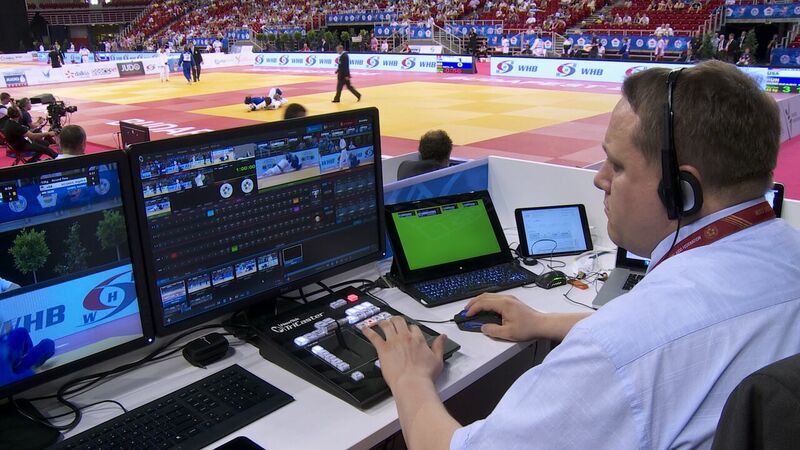 NewTek’s LiveText plays a very important role during the games, including providing all CG text and lower third supers to the program being switched on the main TriCaster. While the Texas Legends initially used a different live graphics system from a leading CG vendor, they soon switched to the more affordable LiveText system, primarily because it was easier to operate. A custom app allows LiveText to accept a real-time statistics feed—in an XML format— and use it in on-the-fly creation of live graphics. For example, when the LiveText operator clicks on a player’s name from a list in the app, the system automatically positions the player’s season stats under his headshot. For the NBA D-League, broadcast and online video exposure is particularly critical because these minor league players are trying to catch the eye of NBA scouts. Their hope is to move up to the NBA team their D-League team is associated with or to be drafted onto another NBA team. 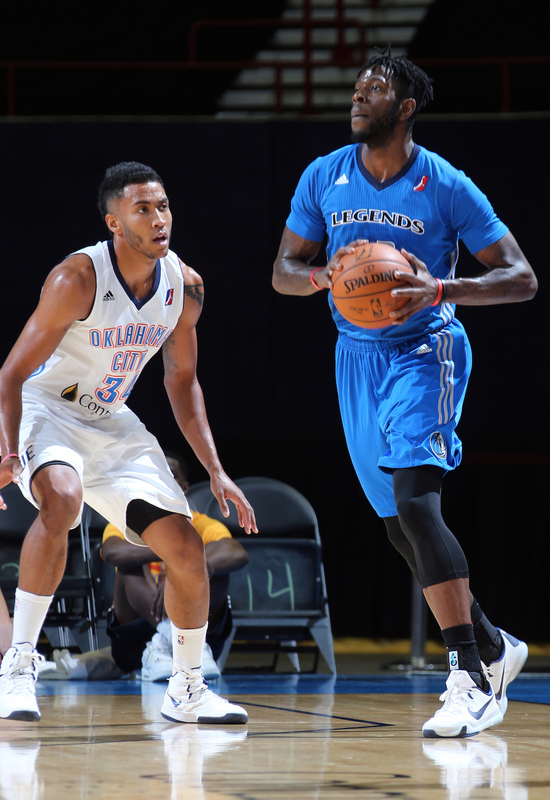 For many of the 10 to 13 players on the Texas Legends roster, this means the chance to play for the Dallas Mavericks. NBA custom app for live sports statistics and real-time data feed For more information about the Texas Legends, visit http://texas.dleague.nba.com/. And for more info on NewTek’s compact, affordable, multi-camera video production systems, visit newtek.com.